Buttons BeCause: Do you like games? Thank-you for all of your condolence hugs and messages. I've been trying to find quiet things to occupy our days. The other day, I decided we needed some fun. I got out one of my Christmas presents. It was a good day to play my new game Farkel. Barnsie, Scruffy and Barnes all said they wanted to play. Barnes started reading the rules. he needed a Trader Joe's Peppermint Joe Joe's Cookie. and asking if I was going to have one? I decided I better get one before he ate them all. By the time it was Barnes turn again, I could see the cookies in his eyes. 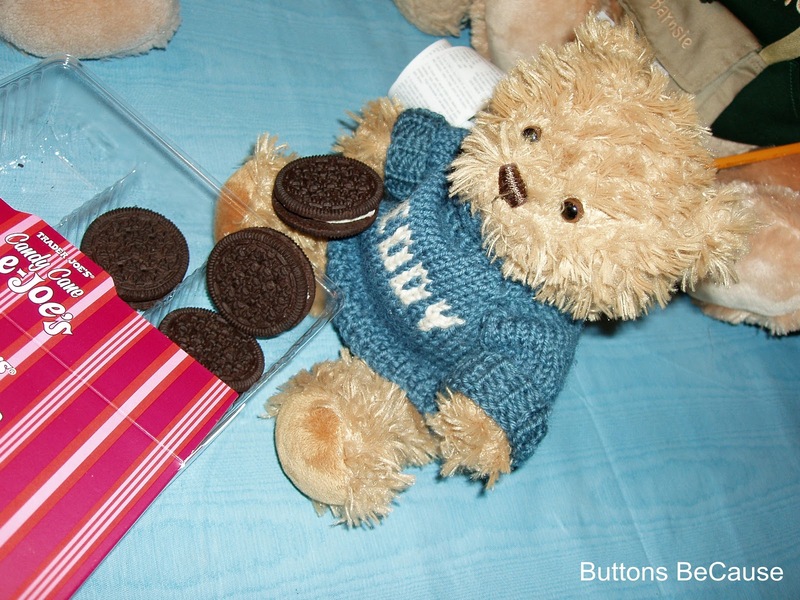 I knew I had to distract him before he ate the rest of the cookies and made himself sick. So I made him take over the score keeping. We played on. Then Scruffy started scoring BIG points! He threw straight after straight and beat us all! Best news was Barnes managed to stay out of the cookies. Something I found difficult myself, they have a crunchy candy peppermint creme filling. 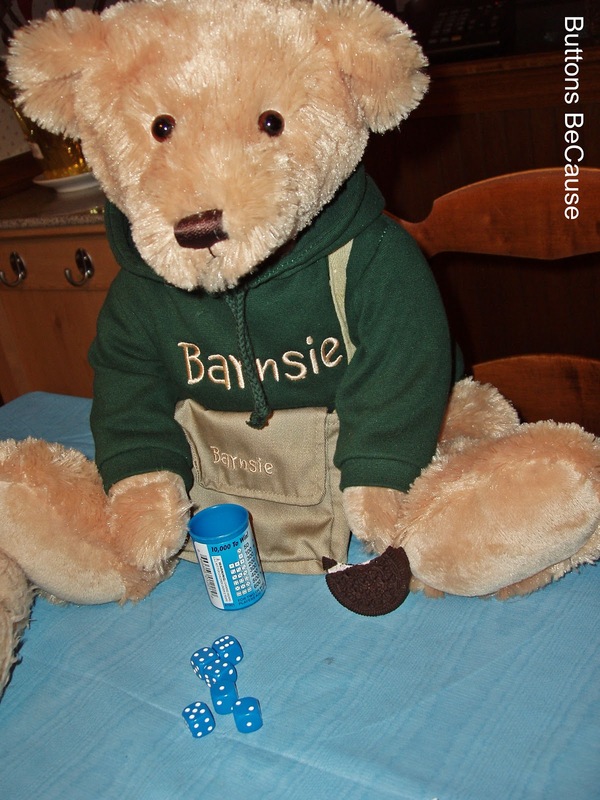 If you have never played Farkle it's loads of fun! It is available in various versions. Mom and dad gave several Farkel games as Christmas gifts. That's why we all laughed so hard when they received a Party Farkel game as a gift. silk ties from Brooks Brothers. They are from Scruffy and my Bro. T. I think if you click on the picture you can see it larger. Some of them have polar bears on them. They are supposed to be ornaments, so there really isn't enough length to go around a bears neck, let alone tie. Mom says she thinks she might be able to convert them to clip-on ties, if not I'm hanging them on our bear tree next Christmas! Well I think I'm as caught up on Christmas reporting as I'm gonna be. Sorry this has taken so long! I think I need a new secrabeary. I can't believe January is almost over. We love to play games here too! My favorite game is Regenwormen (Rain worms). It's played with dice too! 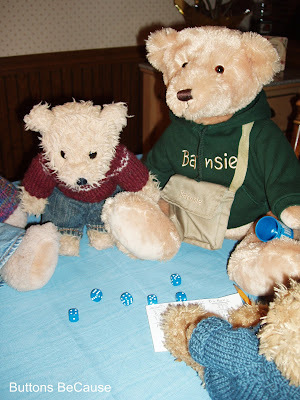 Farkle is fun, but I only played it on the computer. My favourite dice game is 'Biggen' (Piglets) the dice in that game are small pigs. I like the ties. I hope your mom will be able to make them into clip ons. Maybe you can find one at a thrift store to take the clip from! 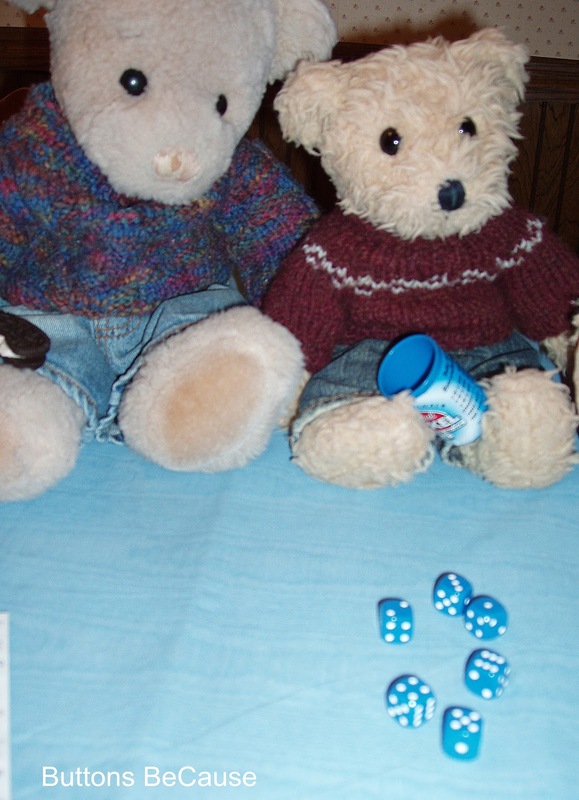 OH yes, we love to play games too, especially with good friends, and a nice bowl of popcorn to much on!